Looks like Best Buy isn’t the only major retailer slashing the price of the BlackBerry Playbook as Staples is now offering the 7-inch tablet for a price of only $299 for the 16GB, WiFi model. The original price of the BlackBerry PlayBook was $499. It is no secret that it didn’t sell well, so hopefully a drop in price will give RIM some insight as to the proper price point for a tablet such as the PlayBook. The 32GB and 64GB models also received price drops to $399 and $499 respectively. Despite the fact that it never really took off, the PlayBook is actually a very nice tablet. 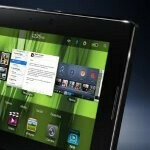 Other than its high-resolution 7-inch display, the PlayBook is powered by dual-core 1GHz processor and 1GB of RAM. The user interface is different than what you would find on BlackBerry smartphones. It is a QNX based operating system that brings webOS like cards to the tablets main screen for easy multitasking. Web browsing on the PlayBook is also quite a treat. The WebKit browser supports both HTML-5 and Adobe Flash Player 10.1. Rounding out the tablet experience is a set of cameras. A 5 megapixel camera occupies the rear while a 3 megapixel shooter is perched on the front. For only $299 you can’t really go wrong here. There are no rebates and no catches. For a price like this, is anybody going to head to their local Staples to pick up a BlackBerry PlayBook? for another Benjamin off i would buy this purely for the browsing experience. that's where this thing truly excels with it's OMAP4430 and it's light browser with full Adobe Flash. it's a real delight. when it gets Flash Player 11 with Stage 3D support it'll be amazing. Might have to pick this up. I have been wanting this playbook since it was announced. $299 is affordable.